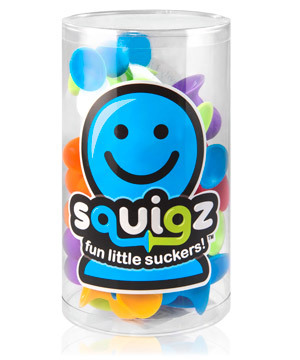 Get sucked into a creative building experience with Squigz, a set of silicone shapes with suction cups that stick to other Squigz and to flat surfaces. The kit encourages kids to free-form build and create funky structures. 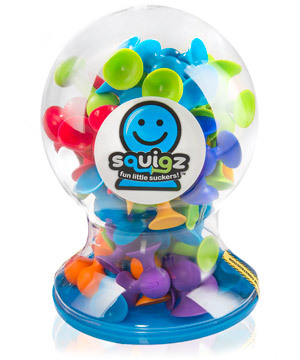 Every Squig is a silicone ball with one to six suction-cupped stems coming out of it. 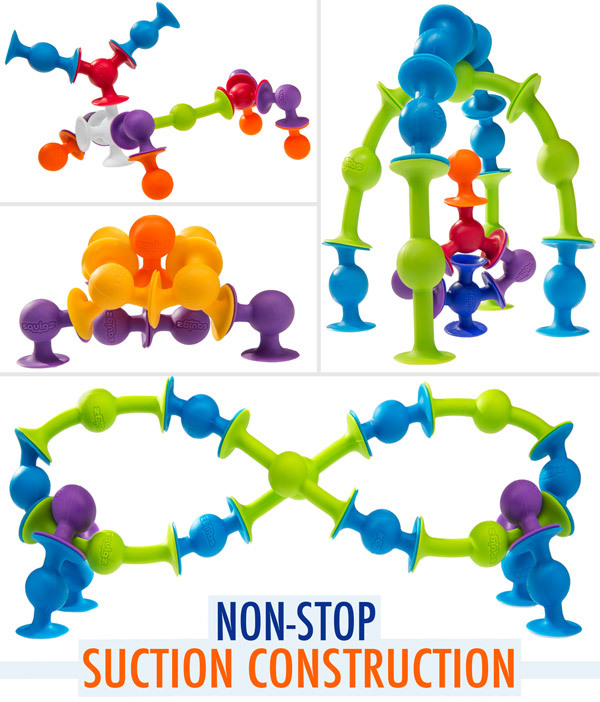 Join the pleasantly pliable shapes together to build real-world shapes, geometric patterns, and abstract sculptures. Stick them together or to walls, tables, windows (great for road trips! ), and more and remove them without leaving any residue. And the icing on the Squigz cake? 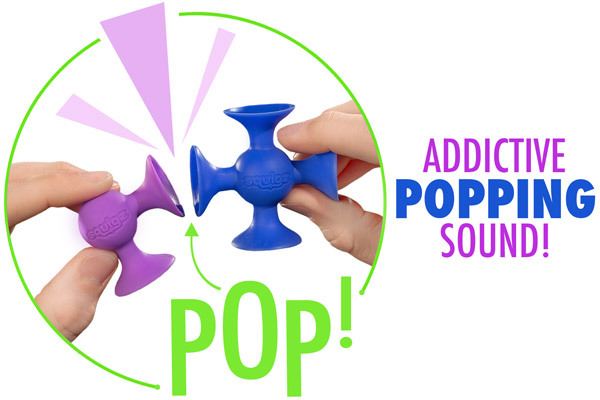 When you construct with Squigz, you’ll discover the pieces separate with a satisfying “pop”! Available in sets of 24 or 50. Squigz stick to any smooth hard surface, regardless of its orientation. You can build a Squigz tower from a table top, cascade a waterfall from the wall of a bathtub, or get a boost and suspend a rope of Squigz from a skylight. And Squigz stick to other Squigz to make complex structures. 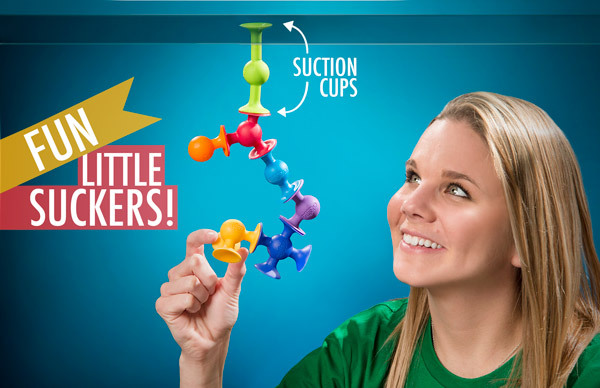 With Squigz suction cups, you can build down from above as easily as up from below. 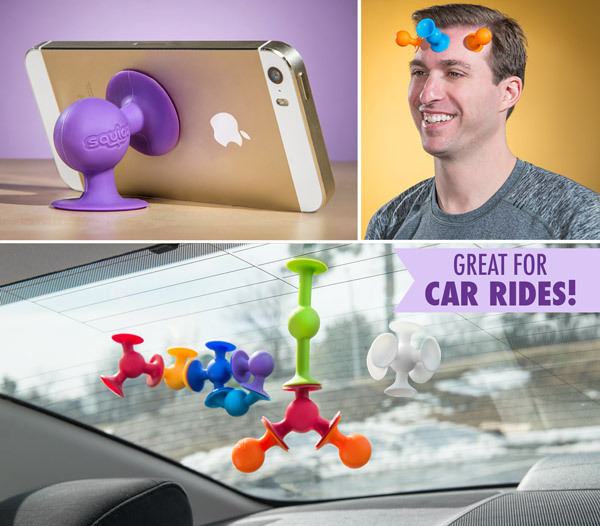 Each of the eight Squigz shapes are designed for maximum fun. The silicone stems flex and bend while the suction cups keep them firmly secured to one another. Make symmetrical structures, assemble an animal, or build a blob of Squigz. No matter how you’re putting them together, you’ll enjoy the experience. 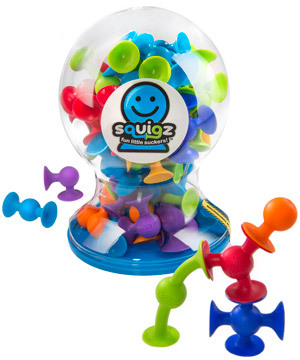 Use your infinite imagination to build all sorts of things with Squigz. It’s no secret assembling Squigz into complex arrangements is all kinds of fun. But it takes a certain amount of discipline to get that far, since simply sticking and unsticking a single Squigz piece is a sensory symphony. Each time you stick a Squig, it makes a satisfying squelch, and pulling it off makes a pleasant “pop” that you can hear and feel. Sounds like the kids are going to be occupied for a while. When you’re playing with Squigz, you can’t make a mistake. You can’t do it wrong, so start sticking Squigz to themselves, surfaces, electronic devices, people (yes!) and cars. 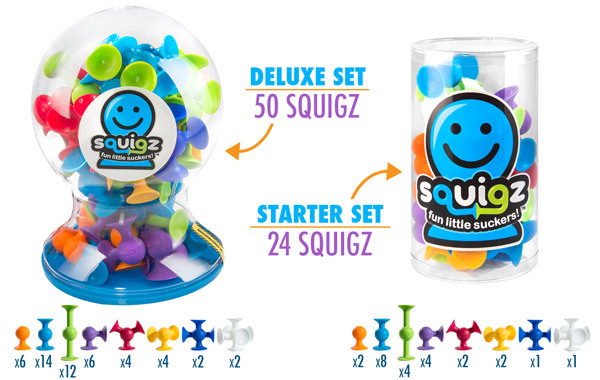 Squigz don’t come with instructions, so here they are: Play! 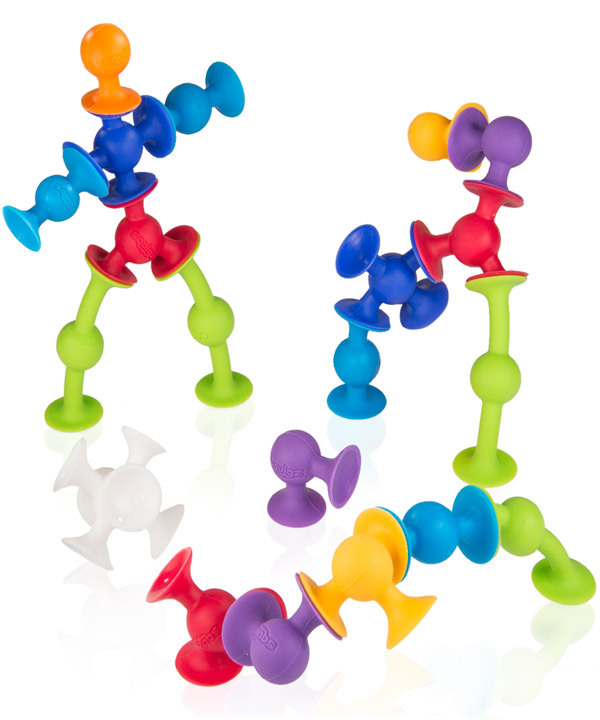 Each set of Squigz comes with eight awesome different shapes. The starter set will get you hooked while the deluxe set enables you to build big. The only way you can go wrong is not getting any. Choose between Deluxe and Starter sets. Or don’t choose and just buy both!